Have you ever been shopping with a three-year-old? There are a few things to know before you go. Be prepared to cut the trip short if he gets cranky. Don’t expect him to ride in a stroller – he thinks he’s too big. But don’t expect him to walk very far, either. Be prepared for lots of, “look how cool this bright shiny thing is! I need it, need it, need it!” And finally, either limit his beverage intake or know the location of every bathroom in every store and be prepared to visit all of them. When I was the mom of a three-year-old, I knew the layout of every store in the mall like the back of my hand. I knew which restrooms were always well-stocked with seat covers, and which ones continually ran out of toilet paper. I knew which store had the cool hand dryers and which one had the nasty-smelling hand soap. I spent a fair percentage of my shopping time in the restroom, while my daughter went potty. 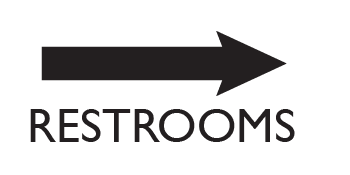 I often pointed other shoppers to the restrooms in various stores. I’d notice them wandering around, muttering to themselves, and could tell they were looking for the facilities. Some stores seemed to be embarrassed to even offer bathrooms (or they just didn’t want shoppers to use them), so they stuck them in the strangest places. Some stores proudly displayed signage that pointed shoppers to the restroom; others didn’t. Thankfully, my daughter is much older now, and easier to shop with. We don’t often use the restroom during a shopping trip, but when we do, we’re often stymied when trying to find it. Directional signage inside your store is important. A study in Canada asked shoppers what irritated them during their time in stores. On a scale of 1-5, shoppers ranked various irritants. “Directions within the store are inadequate” ranked a 2.98. Once shoppers are inside a store, they should be able to find everything they need quickly and easily. Let them become irritated by failing to provide directional signage, and they’ll seek out another store. Large stores with more than one floor absolutely must provide large, clear directional signage. I hate stores with escalators that don’t have adequate signage nearby. How do I know where to find Men’s Wear? Shall I travel up and down the escalator until I see it? Sometimes elevators don’t have signage inside. I guess I was supposed to look before I got on the elevator. If I didn’t, it’s my own fault that I have to just pick a floor, get off and hope I chose correctly. Once I’m on the right floor, some directional signage is really helpful. Especially in a large store. I don’t really want to tour through Swim Wear, Lingerie and Shoes to find Accessories. Just show me where they are the minute I get off the escalator. 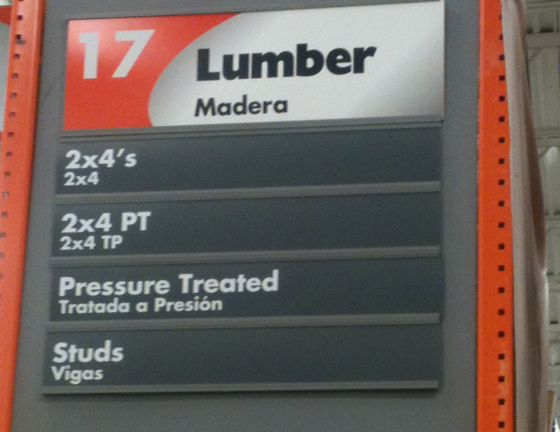 Home improvement stores can be even more confusing. I do patronize those stores occasionally, but most of their merchandise mystifies me; it’s the kind of stuff plumbers, electricians and contractors need. I have no idea what a stud finder is, and I don’t want to know (though I might have been interested twenty years ago, when I was single). When I walk into a home improvement store, I instantly feel out of my element. Thankfully, larger chains have the right idea. They have clearly marked signs above each aisle, listing what kind of product can be found there. I don’t have to walk three miles, dodging forklifts, just to find a garden hose. When your patrons will be traveling through your store or facility long distances to get to their destination, make sure you have plenty of directional arrows along the way. This applies to government-run agencies such as airports, parks, bus terminals, subway systems, but it might also apply to your museum, botanical garden or other tourist attraction. 1. 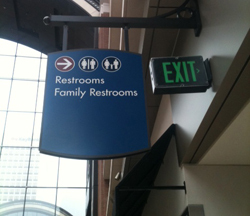 Hang directional signs for restrooms nice and high so people can find them from any point in the store. 2. Ensure that the signage is clear, the text is readable and the arrows make sense. 3. 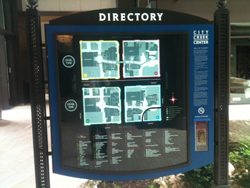 Place directories near escalators and elevators. 4. Place a small directory inside the elevator. 5. Hang directional signage above each aisle. 6. Place directional arrows along the pathway toward the destination.